The Liquid Force Element blends the best of freestyle and freeride worlds into one package. It packs crazy pop and energy, together with excellent comfort and maneuverability. It is a perfect board for progressive riders who want to take their game to the next level. The board works really well in most conditions you can encounter. 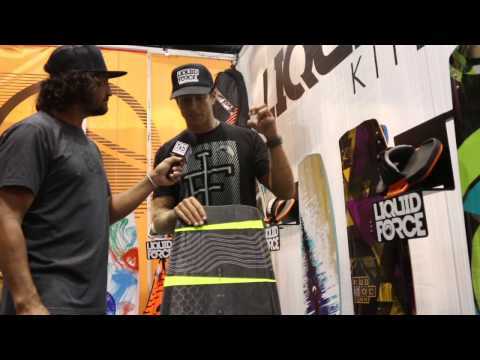 If you like throwing freestyle moves and big airs, the Liquid Force Element is the board for you. It is especially crafted for riders that enjoy freestyle and freeride. The board is crafted by the Liquid Force Engineers in collaboration with PKRA rider Christophe Tack. It features a compact shape with slightly fuller hips that allows it plane almost instantly and ensures excellent control. Special quad channels placed in the tip area ensure a superior water channeling for better control and grip. The shallow concave hull ensures very good speed plus a clean and smooth glide. The rocker is optimized for freestyle maneuvers and smooth landings, as well as for superior upwind performance. The element packs an explosive pop, but it’s also easy to handle, even in difficult conditions. It is built using a CNC wood and PVC composite core that delivers the perfect flex, Biax/triax glass layers, Biax longitudinal reinforcement strips, Liquid rails and a Printed matte or gloss sub straight finish. Liquid Force Element 2015 Average Rating: 5.0 out of 5 based on 1 user reviews. Tons of pop, super fast planing, drives upwind like a train. A board for pros. It's super fast in between tricks, but not very forgiving. You need skills to handle it bro!